I am happy to know that Spotlight is now open at the Mines Shopping Centre. I think this one is bigger than the one in Ikano Power Centre. This month I bought a lot of planner especially Webster Color Crush Planner - Pink and Gold. I gave the Pink one to my daughter and I kept the Gold one. I also bought Kikki K A5 Large Texture Ocean Planner. I've finished reading Big Little Lies. Love the book!!!! Highly recommend this. I received my first box of The Messy Box subscription this month. I am beyond excited! Love the product from ABeautifulmess. I am finally making a review of which iPad Stylus I think works for me. I am so into writing and I have been hunting for the best stylus to use with my iPad. I finally found it. I am thinking of making a few blog post a month about memory keeping. I love memory keeping and I think everybody should do it. It's human nature. I am making my personal mission to document my life in 2015. Life is too precious to let left undocumented. 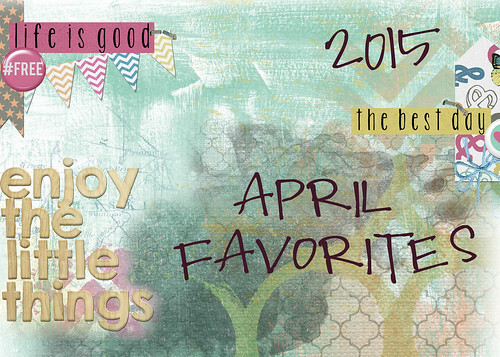 I hope you had an amazing April. No matter how hard life gets, try to stay positive and look for things to be grateful for.